Artwork of the S.S. Dolphin II. The S.S. Dolphin II (ドルフィン２?) is Captain Olimar's vessel in Hey! Pikmin. At the start of the game, Olimar is piloting the ship to head back to Hocotate, until he hits an asteroid and plummets to an unknown planet. The ship crashes against the ground, and stays in that state. The cone of the ship has a detachable pod with its own artificial intelligence. This pod guides Olimar throughout his adventure. After the crash-landing, the ship requires certain amounts of Sparklium to recover its disabled features, and provide Captain Olimar with updates. A list can be found here. The Dolphin II shares similarities with both the S.S. Dolphin and Hocotate ship. It has only three fins, two ionium jets, and sports the familiar white and red color scheme of both vessels. Like the S.S. Dolphin, the ship only has seating for Olimar as well as the color blue being featured in both ships' designs. The Dolphin II is more similar in shape to the Hocotate ship, and features a research pod similar to the ship's. It is rounder in appearance and features four small rockets in addition to having a propeller. Unlike either ship, however, the Dolphin II does not seem to have a Chronos Reactor. Some cutscenes take place inside the cockpit. At the start of the game, because it's out of Sparklium, only emergency lights are on, but as more Sparklium is recovered, more and more of the ship's interior lights up. The layout only changes when certain levels of Sparklium have been reached, which sometimes coincide with an upgrade unlock. None Only the control monitor and the meal table have any lighting. The ship's speaker is also completely active. × 2,000 The walls are now a bit lit up, as are the various control panels. The strips of lights below each control panel are on, but fade between soft and bright. × 6,000 The floor is now lit, and the back walls are a bit brighter too. × 14,000 The light strips above the control monitor are lit up, and light up filling in a pattern from the edges to the center. Light also comes from downstairs. × 22,000 Everything is a bit darker in favor of the new disco ball in the ceiling, which lights up parts of the room with its reflections. × 30,000 Searchlights have been installed on the floor, shining light upwards to the ceiling. The exploration pod is Olimar's assistant throughout the events of Hey! Pikmin, guiding him all along his adventure. It is the pod at the nose of the S.S. Dolphin II, and it houses the ship's cockpit room and artificial intelligence system. 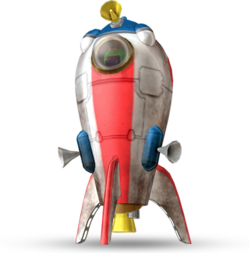 It is able to fly around freely and communicate with Olimar via a loudspeaker, as well as beam him and any Pikmin he's got with him inside, to return to the Pikmin Park. In general, it looks physically similar to the Research Pod in Pikmin 2. The pod can be seen at the end of each area, serving as the exit. If the area has a secret exit, then the pod can be found in the location of both the normal exit and the secret one. The exploration pod is also present in the Pikmin Park, in some cutscenes at the beginning and the end of the game. At the start of the story, it helps the player learn the mechanics of the game. One of the S.S. Dolphin II's components plays an important role in Hey! Pikmin's plot, in that without it, the ship cannot return to Hocotate. The ship first realizes that it is missing when the player reaches × 30,000; a cutscene plays where the ship analyzes if they are ready to return to Hocotate, and realizes that the Sparklium Converter is missing. If this happens before The Last Lair is completed, the ship will not be able to find it, and will tell Olimar to continue searching, in hopes of finding it in his adventures. Otherwise, the ship will try a scan, and will find that it is in the last sector, and will also detect a massive creature, the final boss of the game. Warning: the following text contains major spoilers about about the final boss in Hey! Pikmin. After the fight against the Berserk Leech Hydroe, the creature will wither and die, and from inside, the Leech Hydroe will pop out, with the Sparklium Converter lodged in its head. It will try to attack Olimar, but will just end up toppling on the ground and dropping the ship part. After trying to understand what the creature is, only for it to run away, Olimar triumphantly recovers the ship part and the S.S. Dolphin II manages to make it safely back to Hocotate. In the logs for the Leech Hydroe, it is revealed that the Sparklium Converter must have fallen off during the crash, and landed on top of the creature while it was sleeping. The ship's pod talking to Captain Olimar after the crash-landing. Olimar going up and down the ladder. Olimar sitting at the pilot's seat. Olimar roaming around in a circle. The cutscene after the final boss's defeat. The North American Hey! Pikmin site misspells S.S. Dolphin II as S.S. Dolphin 2. This page was last edited on October 30, 2018, at 18:11.